In patio door design, the hardware is a small detail that makes a big difference. It contributes to the function and beauty of the unit, and it’s an essential part that completes the utility of the whole. It should never be an afterthought because a wrong choice can affect the success of your patio door replacement. Your patio door hardware must be consistent with the existing theme in your home design. If the fixtures in your space are predominantly chrome, choosing brass could be visually jarring. Think of it as something that ties everything together; when it can coexist with the rest of your design elements, expect marvelous results. We provide a dual hardware option, allowing you to choose different pieces for hinged or sliding patio doors. This way, your replacement units can mesh with your home design inside and out. Inferior hardware finishes deteriorate with time and everyday use. Not all that glitters is gold, as they say. It’s imperative to choose your patio door hardware with foresight to ensure its functionality and beauty over the long term. At Renewal by Andersen of St. Louis, we offer you the impressive Estate™ collection of hardware with eight metallic finishes. Our brass, chrome and nickel options have a special coating that protects the desired finish against tarnish and corrosion. Our bronze finishes have a “living” patina, allowing them to become lovelier with time and use. Exterior doors safeguard one of your home’s main entry points. This is why you should choose contemporary or traditional French doors with a sophisticated locking mechanism for security. An exterior keyed lock or a simple latch alone won’t suffice. Moreover, invest in every optional lock available because you can never be too safe. For instance, our sliding door systems can come with an auxiliary foot lock that offers another layer of protection. 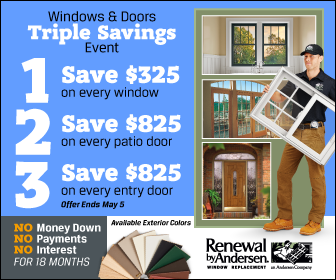 Hardware is only one of the many details you can customize in Renewal by Andersen of St. Louis’s patio doors. Learn about the rest during our initial visit. Call us at (314) 332-2364 today to schedule your FREE, in-home consultation in St. Louis, MO, to discuss your project in detail.